Wimbledon is back for 2018 and if you’re looking for a reliable way to watch all the Tennis action then I’ve got the details you need. Wimbledon is one of the biggest Tennis tournaments in the world and it’s certainly the biggest in the UK. Unfortunately though if you’re outside the UK your access to coverage can be limited. In some countries there is absolutely no coverage of Wimbledon, in others, there is limited coverage and highlights and in some, you need to subscribe to an expensive cable network that you may not even have access to. There is however a solution. So whether you’re a Brit abroad and you want to keep up with Wimbledon or you’re just a massive Tennis fan and want to watch as much coverage as possible then read on and I’ll show you how you can. The main Wimbledon tournament for 2018 is set to kick off from 2nd July. The entire tournament in the UK is being shown on the BBC channel. At the same time coverage of nearly every match will be shown on the BBC’s online streaming service the BBC iPlayer. There are a number of live streams shown concurrently on BBC iPlayer. Unfortunately, if you’re not in the UK it’s impossible to access BBC iPlayer directly because you’re blocked from viewing. However, with the help of an app called a VPN you can avoid those blocks and watch Wimbledon 2018 abroad in any country in the world. 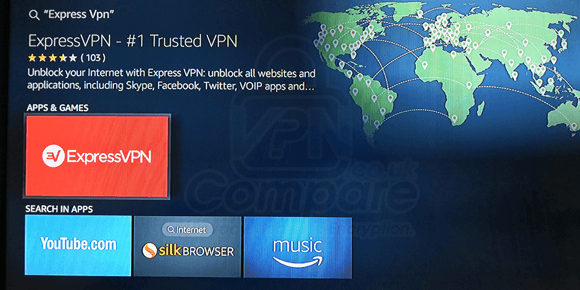 VPN services are legal privacy tools that help stop hackers and others from snooping on what you’re doing online. Part of that privacy protection is by allowing you to appear somewhere else. So if you’re in America for example you can make it appear as if you’re in the UK. Although they sound like they’re going to be really complicated, they’re not. VPN services come in the form of apps for almost all devices and within 1 or 2 taps you can be connected and watching Wimbledon 2018 abroad with ease. Below I’ll show you how to watch Wimbledon 2018 on a computer, laptop, tablet or phone and in the section below on an Amazon Fire TV or Firestick. 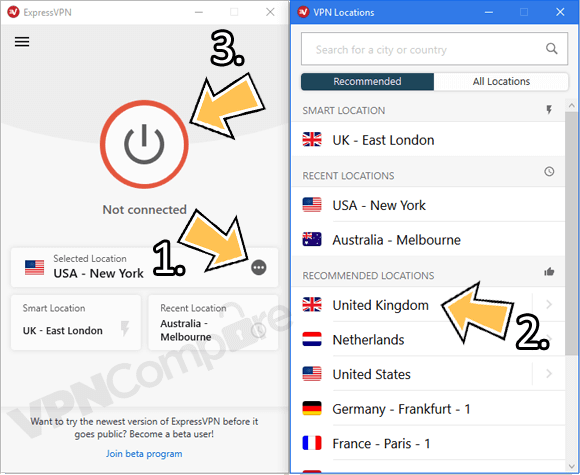 In the example below I’m using ExpressVPN because they work with more devices than most, but you can select any of the three above. Once you’ve signed up go to the ‘Products‘ section of the website and download and install the correct app for your device. Open the app and login with either your email address and password or the activation code which can be found in the ‘My Account’ section of the ExpressVPN website. On the app select Choose Location (1) and then select United Kingdom (2). The app should connect for you but if not press the Connect (3) button. Once the app has connected just visit the BBC iPlayer website. You can now watch all the Wimbledon action. You’ll now be able to watch the various Wimbledon matches on BBC iPlayer without any issues. There are also available catch-up programmes so if you can’t make the live viewing every day you can also watch replays and catch-up action. Once you’ve finished watching Wimbledon just select Disconnect on the ExpressVPN app and your internet connection returns to normal. It’s worth remembering that there are no limits on how many times you can Connect and Disconnect from the service or how long you stay connected. This means you can watch as much Wimbledon action as you want. If you’ve got an Amazon Fire TV or Firestick then the good news is you can use it to watch Wimbledon 2018 abroad on your TV. For this you’re going to need to have the BBC app installed on your Fire TV or Firestick from the Amazon store. If you haven’t got it then install it first, it’s a free app. You should now click on to Install or Download the app. Wait for the app to Install. Now press the ‘Home‘ button and then click on the newly installed ExpressVPN app. Login with your email address and password. It’s the same one you created when you signed up for the ExpressVPN service. Press Choose Location and then click on United Kingdom. The app will start to automatically connect for you. Once the app has connected press the ‘Home‘ button and then select the BBC iPlayer app. You can now watch all the Wimbledon 2018 action live on your Amazon Fire TV or Firestick in any country. 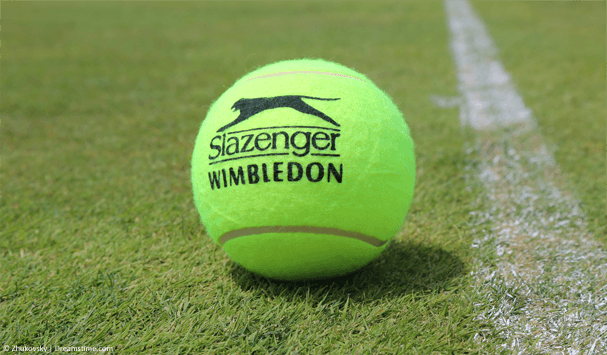 Wimbledon 2018 starts on 2nd July 2018 and runs until 15th July 2018. That’s 2 full weeks of tennis action you can watch live or on catch-up from anywhere in the world. The good news is that for the first time the BBC will be streaming Wimbledon in 4k to a select audience and when using a VPN as long as you have a fast internet connection you’ll be able to take advantage. Their first major showing of 4k sport was this year’s World Cup in which the first 10,000 viewers got the option to watch in 4k. It’s likely to be a similar affair for Wimbledon so if you want to be able to see each blade of grass and watch the tennis action in the top quality, make sure you get online early. Controversy has already started this year after Serena Williams was seeded 25th even though she’s outside the top 32 in the rankings. Williams has been out of action after giving birth to a child in September and currently sits 183rd in the world. In comparison world number 32, Dominika Cibulkova from Slovakia hasn’t been seeded at all. It’s clear Wimbledon seeding selectors have looked at Williams past glory rather than her current status in awarding her such a seeding. Seeding for the men’s and women’s tournaments are different which means Scotland’s Andy Murray isn’t seeded this year as he is outside the top 32 rankings in the world. Whatever you think of the seedings this year’s Wimbledon is going to be another classic so if you don’t want to miss it, grab yourself a VPN and watch anywhere in the world. To watch Wimbledon 2018 abroad you’ll need to get yourself a VPN app. These work for computers, laptops, tablets, phones and even the Amazon Fire TV and Firestick. There are hundreds of VPN services out there and not all work with BBC iPlayer who are showing Wimbledon. My recommended provider is ExpressVPN and you can sign up for their service by clicking the big orange button below. Once you’ve signed up, download and install their app for your device, connect to the UK and enjoy watching Wimbledon 2018 live abroad wherever you are in the world. Who are you looking forward to watching in this year’s Wimbledon and more importantly, who do you think will win? Why not let me know in the comments section below, I’d love to hear.